PDF Summer Camp Flyer is available for download here. Turn in “Consent/Health History and Hold Harmless Agreement”, which is required for some activities, such as climbing wall, COPE, etc. If registered for Snorkeling & SCUBA, additional special forms are required. If medication will be taken by the Scout while at camp, complete the “Troop 200 Scout Medication Release Form” and bring this with you along with any medication on the departure day. DO NOT pack the form or the medication. It must be handed in at the table on the morning of departure. Review the prerequisites for your merit badges and be prepared to show verification or completion of these prerequisites. Swim trunks & towel – these are only needed if you have not taken the swim test in 2013. If you have taken the swim test, pack these in your scout locker. Buy some 1 gallon or 2.5 gallon zip lock bags and pack daily clothing in the bags. Label anything that you want to come home!!! Don’t bring anything you can’t afford to leave behind! All other supplies in the locker! If you have much more than this, you have probably over packed! The following list is provided as an aid to Scouts as they prepare for summer camp. It is not all encompassing, and we encourage you to check with other veteran Scout campers to assist in your planning. The Scout Handbook is another great reference! To be worn during travel to/from camp, at evening dinners, opening/closing flag & campfires. If you have not taken the swim test, do not pack these, carry these items with you to camp. Athletic shoes and/or comfortable hiking boots. Bring 2 pairs of footwear. No open-toed shoes! Small Day Pack for carrying items around camp like merit badge notebook, prerequisites, pen & paper, swim trunks, Class A shirt for dinner, camp map, camp schedule, clip board, etc. You will not need tents or sleeping pads. Tents and cots with pads are supplied by the camp. Personal hygiene kit: soap, cloth, towel, toothbrush, paste, comb, deodorant, lip balm, etc. If working on Swimming merit badge, you will need loose fitting pants, a loose fitting button down shirt and extra shoes that can get wet for the fully clothed swimming test. If working on Boating or Lifesaving MB’s, you will also need an extra pair of shoes for the water. Prerequisite materials or proof of completion of prerequisites; First Aid item 2d is best done before camp. 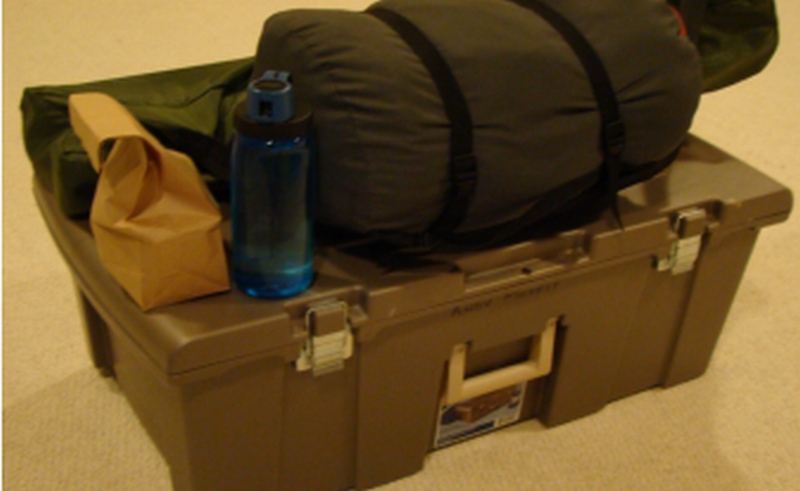 Note: Typically all clothing, personal items and merit badge items will fit in your locker. If you cannot fit the items in your locker, you probably have packed too much. Your “Gear” items will probably not fit in your locker and should be tied together and labeled with your name.